We stop and stand; roll one foot and then the other on the floor; pressing; pushing. We kneel and continue the exploration of one foot on the floor – every side of it including the top, and then the other foot – supporting ourselves with our hands. What about our legs, and contact with the floor? We can spread them; reach; slide on them. 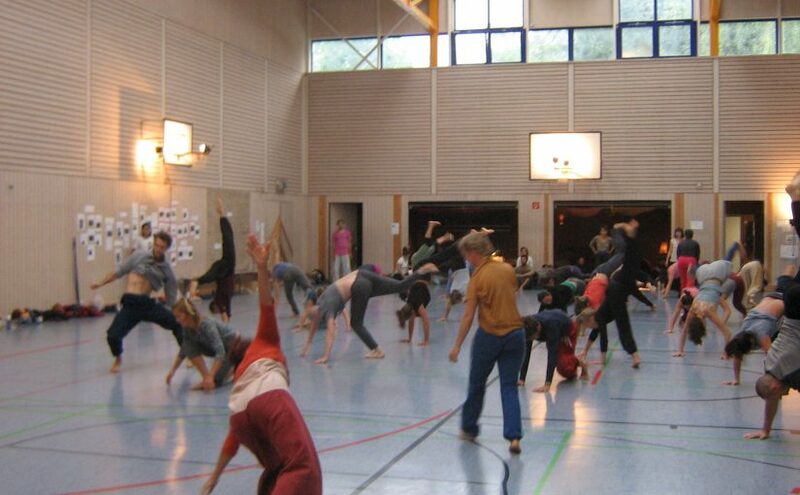 Now, feet on ground and hands too, we traverse the space on all fours – ‘Down Dog’ or Capoeira style. We line-up on one side of the hall and move across the floor in lines to the other side. We’re on hands and feet, sliding, keeping our legs and feet in contact with the floor: we are drawing with our feet on the floor says Olivia. Now our focus is our pelvis and our centre. The class divides into two; one half sits out and watches; the other traverses the floor – moving their pelvis across the space and in the air. We swap roles with our partner. We work with a partner – one lies on their back on the floor looking up. Our partner straddles us, with their hands and knees on the group. The underneath person uses their hands on the bottom of the ribs, and then the pelvis so as to manipulate and maneuver the body above them. It looks funny when demonstrated – quite sexual – people titter! We continue the partner work now that the pelvis and spine have been mobilised. Our partner moves in the space, and we guide their pelvis as they move, applying pressure from our hands – creating pivot points and spiral movements. We swap roles. There’s a clear leading and following in this exercise; we change it to allow use of other parts of our body – pressing, sliding to articulate movement other than hands. Of course, this leads to jamming as the roles dissolve. Once again, we build on the previous days routine. New movements: Olivia slides over Yochai’s back when he is crouching, to a table/bench position from which he can handstand at her side; his pelvis and back arches over her into contact; he exits by dropping his pelvis off her, to crouch on he floor. See the video below for the opening of today’s routine. From being in table, Olivia contacts on Yochai’s arm and shoulder on her neck/shoulder, and she rolls-up and stands. Moving together they stand; and Olivia brings lifts him. See the video below for this day’s complete routine.